The War For Late Night is a solid piece of reporting of a kind that you don't see much any more. Carter is an unshowy, unhistrionic writer who assembles his facts, checks them and spins them into a compelling narrative. He's done a lot of research and interviewed almost all the key players in the drama of how Jay Leno lost, regained, lost and regained The Tonight Show on NBC. The basic tale is well known. Jay didn't want to go but was forced out because NBC were afraid of losing Conan O'Brien, the dauphin. 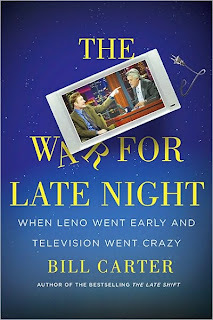 Terrified that Leno was going to go to Fox or ABC, NBC came up with a silly plan to put a Jay Leno show on in primetime, soon after Conan would take over The Tonight Show. Conan debuted on The Tonight Show and his ratings were weak, Leno's show debuted in primetime and his ratings were a disaster. The NBC affiliates revolted, wanting Leno off the air, but to fire him would cost NBC a fortune so they decided to put on a mini Jay Leno show at 11.30 and push Conan's Tonight Show back to 12.00. Conan refused because he said it "would spoil the tradition of The Tonight Show starting at 11.30" and left NBC with a settlement of 40 million dollars or thereabouts. Leno got The Tonight Show back and although his ratings are lower than they were when before he left he is currently back to beating Letterman in the ratings. Conan went to the TBS network where his show gets a tiny but devoted audience. A lot of this is inside baseball and there are few surprises in the story (but there is one big one) and libel laws being what they are Carter has to be careful what he says at all times; so often it's necessary to read between the lines. What I got from the book were the following impressions: 1.) Jay Leno is a hardworking automaton driven by strange inner demons and with seemingly no outside life apart from The Tonight Show or doing up to 160 Vegas shows a year; he has no kids, never takes vacations, spends all of his time with his classic cars or writing lame, dated, middle America friendly jokes. 2.) David Letterman is a surly misanthrope with few friends, blinding rages, and an acidic but often funny sense of humour. 3.) Conan O'Brien (and this is the surprise) is actually a bit of an eejit who takes himself very seriously, has an enormous sense of entitlement and weirdly is almost the villain of the piece. Before I read the book I (and surely everyone else in America) thought Conan was hard done by and that Leno was the jerk: Conan is easy to like because he's young and hip and Leno is easy to dislike because he's old, old fashioned and less edgy than Letterman or Conan. But actually as Jerry Seinfeld points out in the book Conan was the one who threw the hissy fit and refused to compromise, Seinfeld says that all Conan's talk about the traditions of The Tonight Show were high falutin nonsense, arguing that actually its just a stupid TV chat show that's had half a dozen hosts and many time periods and starting times over the years. Seinfeld argues that Conan should have realised that his ratings were horrible and accepted the deal to move to 12.00 without kicking up a fuss. It's an interesting thesis and contra to the Zeitgeist which I always like. Patrick Crawley of USC rates and analyses all 7 late night hosts, here. His winner is Conan and like everyone else he despises Leno.